The past few years have been a roller coaster ride for most food & beverage processors. In 2007, commodity costs spiked to historic levels while sales were at historic highs. Although these input increases put pressure on margins, there was sufficient competitive pressure in the marketplace to keep companies from passing on these price increases to the ultimate consumers. Dexter Manning is national food & beverage practice leader for Grant Thornton LLP. Email him at dexter.manning@us.gt.com or go to www.grantthornton.com/foodandbeverage to learn more about Grant Thornton's industry focus. As the recession became paramount in 2008, consumers reacted by becoming more selective with their food & beverage dollars. As a result, food & beverage companies experienced lower sales volumes. Consumers changed their buying habits in historic proportions by moving to private label brands, shifting to discount retailers and making the art of couponing a new retail buying science. Fortunately for the food & beverage industry, commodity prices moved lower as sales declined, giving companies some relief from the margin squeeze. Although margins had recovered from 2007, the commodity scare and the recession forced food & beverage companies to re-examine their cost structures. Many improved their operations by using lean techniques and better use of technologies. When 2009 rolled around, most food & beverage companies had right-sized their operations and become leaner organizations. Therefore many processors experienced improved profitability and higher margins in 2009, even as sales continued to decline. Are we now moving in the right direction? As Food Processing's 2011 Top 100© list shows, 2010 brought more top line sales for most food & beverage companies while retaining the margin improvements achieved during the recession. In the Top 100 chart, 63 companies reported higher sales and 40 companies increased net income (out of 62 that report their net incomes). Admittedly, some of these companies increased their sales through acquisitions of companies that were not strong enough to weather the recessionary storm of the past few years. In the case of PepsiCo and Coca-Cola, they made strategic acquisitions of their independent bottlers in North America to continue to streamline their operations and to get their products one step closer to their consumers. Further, many food manufacturers have accepted that private label brands are here to stay and have expanded their manufacturing to include this market. In fact, AC Nielsen reported that 17.4 percent of consumer dollars were spent on private label in 2010 verses 15.2 percent in 2006. Hold on now. Things clearly were moving in the right direction in 2010 for food & beverage companies, but the roller coaster ride is far from over. In early 2011, global food prices hit record highs, surpassing the commodity price spikes of 2007. Although commodity prices have moderated by midyear, there is unprecedented upward pressure on world food ingredients that will likely keep commodities higher than historical levels for the next few years. The factors include a rising world population and an ever expanding middle-class. 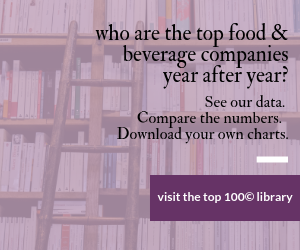 Unlike 2007, food & beverage companies have less competitive pressures as a result of the mergers and acquisitions and companies going out of business. Consequently, they have successfully passed price increases on to their customers. In fact, the USDA predicts food inflation in the 3.5-4.5 percent range for 2011 with greater price increases during the latter part of the year. What does this mean for 2011? If price increases stick, food & beverage companies should be able to hold on to their margin improvements while sluggishly increasing top line sales. While this may not be the best outcome for consumers, it will certainly slow down the roller coaster for food & beverage companies. Separation may kill ConAgras bid for private label powerhouse. Think of them as Kraft-General Foods vs. Nabisco-Cadbury-Jacobs Suchard.